Wilson approached Farm League, tasking the Venice-based film company to come up with a fun and inventive way to launch Roger Federer and Wilson Tennis’ all-new Pro Staff RF 97 Autograph racket. Having the opportunity to shoot Federer in Indio, California, Farm League brought legendary music producer Money Mark of Beastie Boys fame into the mix. Together, these two legends created a bass-heavy, foley anthem using the Pro Staff RF 97 racket as the only instrument. In the 60-second spot, McDowell wove a visual tapestry of motion and sound by capturing the zip of a tennis bag, the pop of a can of tennis balls, the woosh of tennis balls soaring back and forth. 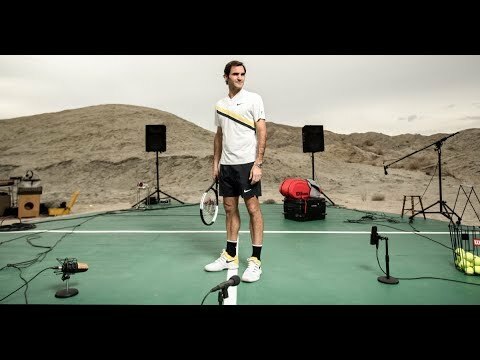 The desert backdrop looked like a tennis court on the moon, creating a compelling juxtaposition as each shot drove the action forward, the ball struck the bass drum and kicked off the 808 boom. As a special complement to the launch, Farm League designed and arranged for the pressing of limited edition vinyl records of the track. An innovative concept that hooks into the worlds of advertising, music and sports – a limited edition RF 97 box set, including the vinyl, will go on sale worldwide on July 16th. This exclusive kit will be limited to 1,200 units globally. The box set will retail for $597.00 (USD) and includes exclusive keepsakes from the campaign. For more information on the box set, visit: Wilson.com/prostaff. Farm League’s experienced group of storytellers thrive by working within the increasingly relevant intersection of sports and music, skillfully assisting brands such as Wilson to launch marquee products by tapping into the synergy of those two worlds. Utilizing their creative, production, and post production firepower, Farm League took the project from concept to completion, turning up the volume on Wilson Tennis’ new Pro Staff RF97Autograph racket’s classic tuxedo design with a truly inventive approach.